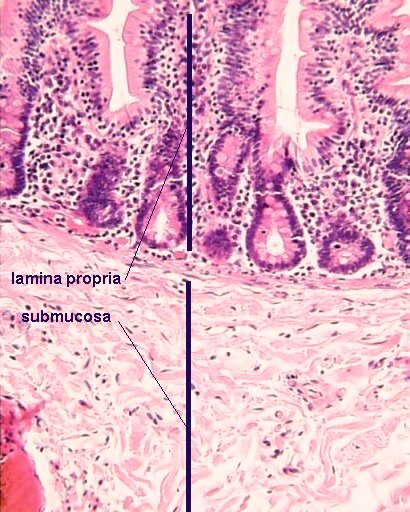 The lamina propria, a thin layer of connective tissue, is part of the mucosa. Here is an example of the mucosa of the mouth. 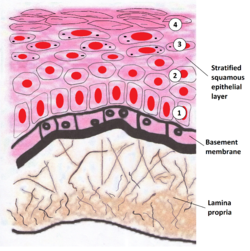 The lamina propria is a thin layer of loose (areolar) connective tissue, which lies beneath the epithelium, and together with the epithelium and basement membrane constitutes the mucosa. As its Latin name indicates, it is a characteristic component of the mucosa, or the mucosa's "own special layer." Thus, the term mucosa or mucous membrane refers to the combination of the epithelium and the lamina propria. The connective tissue of the lamina propria is loose and rich in cells. The cells of the lamina propria are variable and can include fibroblasts, lymphocytes, plasma cells, macrophages, eosinophilic leukocytes, and mast cells. It provides support and nutrition to the epithelium, as well as the means to bind to the underlying tissue. Irregularities in the connective tissue surface, such as papillae found in the tongue, increase the area of contact of the lamina propria and the epithelium. The lamina propria contains small blood vessels (capillaries) and a central lacteal (lymph vessel) in the small intestine, as well as lymphoid tissue. Lamina propria also contains glands with the ducts opening on to the mucosal epithelium, that secrete mucus and serous secretions. The lamina propria is also rich in immune cells known as lymphocytes. A majority of these cells are IgA-secreting B cells. Because the epithelium is often under external stress and is somewhat delicate, the lamina propria hosts many immune cells. In the intestinal tract the immune system must have tolerance to the normal intestinal flora, yet respond to pathogenic microorganisms. Imbalance of this causes inflammation diseases such as inflammatory bowel disease. The lamina propria’s richness in macrophages and lymphoid cells makes it a key place for immune responses to occur. It forms part of the barrier that protects internal tissues from external pathogenic microorganisms, especially from the gastrointestinal tract. The myofibroblasts in the lamina propria make it a very important contributor of inflammation and wound healing responses. Myofibroblasts are capable of releasing cytokines and chemokines in response to stress. Also their contractile capacity may help pull tissue together in the wound healing mechanism. Progression of epithelial cancer often relies on deep and regional lymph node invasion. The lamina propria, being one of the barriers to the submucosa, is an area where epithelial cancer invasion is of significance since lymphatic invasion is an independent predictor of lymph node metastasis, especially in gastric cancer. As soon as the tumors breach the basement membrane and reach the lamina propria, they are exposed to lymphatics which may increase the rate of metastasis and cancer progression. Deeper invasion into the submucosa will increase the exposure to lymphatics. Long-standing inflammation is a risk factor for the development of cancer. The lamina propria macrophages when under much stress release pro-inflammatory signals that may lead to increased probability of developing cancer. An example of this is the over activation of the IL-6/STAT3 pathway, which has been linked to colitis-associated cancer. ^ Slomianka, Lutz (2009). "Blue Histology-Gastrointestinal Tract". The University of Western Australia. ^ Chang, S. L.; Chung, J. S.; Yeung, M. K.; Howard, P. S.; MacArak, E. J. (1999). "Roles of the Lamina Propria and the Detrusor in Tension Transfer during Bladder Filling". Scandinavian Journal of Urology and Nephrology. 201: 38–45. doi:10.1080/003655999750042132. PMID 10573775. ^ a b Andersson, Karl-Erik; McCloskey, Karen D. (2014). "Lamina propria: The functional center of the bladder?". Neurourology and Urodynamics. 33 (1): 9–16. doi:10.1002/nau.22465. PMID 23847015. ^ a b Wiseman, O.J. ; Fowler, C.J. ; Landon, D.N. (2003). "The role of the human bladder lamina propria myofibroblast". BJU International. 91 (1): 89–93. doi:10.1046/j.1464-410X.2003.03802.x. PMID 12614258. ^ a b Rice, Thomas W; Zuccaro, Gregory; Adelstein, David J; Rybicki, Lisa A; Blackstone, Eugene H; Goldblum, John R (1998). "Esophageal Carcinoma: Depth of Tumor Invasion is Predictive of Regional Lymph Node Status". The Annals of Thoracic Surgery. 65 (3): 787–92. doi:10.1016/S0003-4975(97)01387-8. PMID 9527214. ^ Hall, Peter A.; Coates, Philip J.; Ansari, Bijan; Hopwood, David (1994). "Regulation of cell number in the mammalian gastrointestinal tract: The importance of apoptosis". Journal of Cell Science. 107 (12): 3569–77. PMID 7706406. ^ Varol, Chen; Vallon-Eberhard, Alexandra; Elinav, Eran; Aychek, Tegest; Shapira, Yami; Luche, Hervé; Fehling, Hans Jörg; Hardt, Wolf-Dietrich; Shakhar, Guy; Jung, Steffen (2009). "Intestinal Lamina Propria Dendritic Cell Subsets Have Different Origin and Functions". Immunity. 31 (3): 502–12. doi:10.1016/j.immuni.2009.06.025. PMID 19733097. ^ Bischoff, Stephan C; Barbara, Giovanni; Buurman, Wim; Ockhuizen, Theo; Schulzke, Jörg-Dieter; Serino, Matteo; Tilg, Herbert; Watson, Alastair; Wells, Jerry M (2014-11-18). "Intestinal permeability – a new target for disease prevention and therapy". BMC Gastroenterology. 14. doi:10.1186/s12876-014-0189-7. ISSN 1471-230X. PMC 4253991. PMID 25407511. ^ Lee, Ji Yong; Joo, Hee Jae; Cho, Dae Sung; Kim, Sun Il; Ahn, Hyun Soo; Kim, Se Joong (2012). "Prognostic Significance of Substaging according to the Depth of Lamina Propria Invasion in Primary T1 Transitional Cell Carcinoma of the Bladder". Korean Journal of Urology. 53 (5): 317–23. doi:10.4111/kju.2012.53.5.317. PMC 3364470. PMID 22670190. ^ Yonemura, Yutaka; Endou, Yoshio; Tabachi, Kayoko; Kawamura, Taiichi; Yun, Hyo-Yung; Kameya, Toru; Hayashi, Isamu; Bandou, Etsurou; Sasaki, Takuma; Miura, Masahiro (2006). "Evaluation of lymphatic invasion in primary gastric cancer by a new monoclonal antibody, D2-40". Human Pathology. 37 (9): 1193–9. doi:10.1016/j.humpath.2006.04.014. PMID 16938525. ^ Matsumoto, Satoshi; Hara, Taeko; Mitsuyama, Keiichi; Yamamoto, Mayuko; Tsuruta, Osamu; Sata, Michio; Scheller, Jürgen; Rose-John, Stefan; Kado, Sho-ichi; Takada, Toshihiko (2009). "Essential Roles of IL-6 Trans-Signaling in Colonic Epithelial Cells, Induced by the IL-6/Soluble-IL-6 Receptor Derived from Lamina Propria Macrophages, on the Development of Colitis-Associated Premalignant Cancer in a Murine Model". The Journal of Immunology. 184 (3): 1543–51. doi:10.4049/jimmunol.0801217. PMID 20042582. Histology image: 10802loa – Histology Learning System at Boston University - "Digestive System: Alimentary Canal - esophagus "
Histology image: 03301loa – Histology Learning System at Boston University - "Connective Tissue: lamina propria; loose connective tissue "
Anatomy photo: Digestive/mammal/system1/system3 - Comparative Organology at University of California, Davis - "Mammal, whole system (LM, Low)"